Hail Tedesco, the tackle bust king! A childhood spent evading snakes and sidestepping cow dung helped James Tedesco become the NRL's most elusive superstar. Tedesco has made an incredible 20 per cent more tackle busts than another other player in the NRL over the past five seasons. 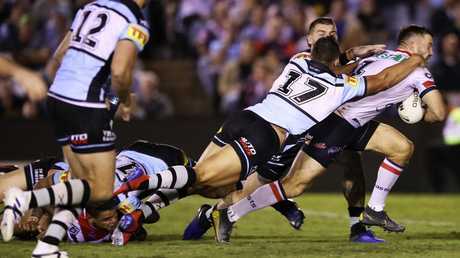 Tedesco has made an extraordinary 560 tackle busts - a whopping 112 more than his closest rival, Canberra's Jordan Rapana, and 167 more than third-placed Rabbitoh Dane Gagai. Fox Spots Lab statistics show Tedesco has created his on-field havoc over 92 games at an average of 6.1 tackles busts a game. Rapana averages 4.8. Tedesco will need every piece of his brilliance during Friday night's massive match against unbeaten Melbourne Storm at AAMI Park. Tedesco's father, John, said his son would run around a specially mowed track which navigated the circumference of the family's 250 acre property in Sydney's south west. "He would do laps around the farm - I had to go and mow a track for him which was 4km around the outskirts," John said. "You'd have to mow it because of the snakes and cow poo. "Not many people have a 4km track in their backyard. I'd mow it with a tractor and make it wide enough so he could see any snakes. "James never said he would go and do it, he just went and did it. You wouldn't know he was doing it so I would have to go ahead of him and mow it. "He would just go off and run it. James always wanted to keep fit. He was big on fitness and was always doing something. There was also a footy field set up where he would practice his goal kicking. People don't have backyards anymore." Over the last five years, Tedesco is running sixth in NRL line breaks and fourth in run metres. "He has a huge power base. When you get up close to Teddy, you realise he is a solid guy. 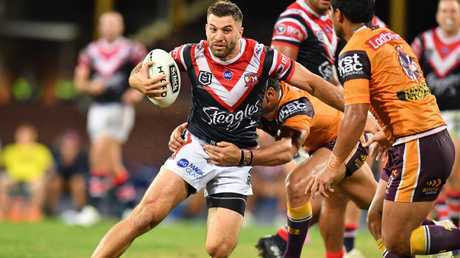 He is 95, 96kg," said legendary Roosters fullback Anthony Minichiello, who helps mentor Tedesco. "That big hip and glute area, that's where you generate power. That is why he gets so many tackle busts. He is also sharp on his feet. "Speed creates power and that creates tackle busts. I think he can certainly get better and Teddy knows that as well. He is searching for ways to get better all the time. That's why great players are great players, because they never stop searching to get better and be more consistent." Former Eastern Suburbs fullback Russell Fairfax love watching Tedesco. "He is a very good attacking player, he can score a try, he knows where to be and he has plenty of pace, I love that," Fairfax said. "The second thing is he's such a good defensive player too. When you're a good fullback, you've got to be able to do both really well. Whether they've got the ball or whether we've got the ball, he does his job and that's what I like about him. "When I used to play, I used to hide behind Arthur Beetson and I would come in when I wanted to come in. I know Teddy isn't copying me but he has learned to go across behind the ball and when he sees a hole, that's where he goes. "The players these days have the opportunity to improve and I think James is very, very good and he will improve, don't worry."